The Netherlands has a top position in research and innovation for TB. Several Dutch research institutes are among the world-leading groups in various aspects of TB research, owing to their expertise, research capacity, international networks and product innovation. Together they can make major contributions to the global TB research agenda. 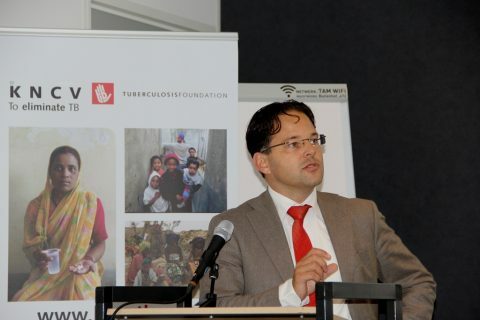 KNCV Tuberculosis Foundation and the Netherlands Tuberculosis Research Platform (NTRP) joined forces and brought together 21 research groups for an inventory process. The outcomes of this process are presented in the White Paper Dutch Research for global TB elimination. Four specific areas of excellence in TB research were identified in which a collaborative Dutch effort brings major, cutting-edge value to the global END TB strategy. Dutch research groups have made, and will continue to make, internationally acclaimed contributions to research that will help accelerate the global elimination of TB. The four areas of excellence identified are: fundamental scientific research into host-pathogen interaction; epidemiological research into understanding and reducing transmission; studying treatment optimization; and improving the health system response, including cost-effectiveness. In addition, Dutch researchers play important roles in building research capacity. At the symposium the White Paper was presented to the Deputy Director of Science and Research, Mr. Michiel van den Hauten of the Netherlands Ministry of Education, Culture and Science (OCW). Download the White Paper (pdf): Dutch Research for global TB elimination. Read more on the 2015 Annual Symposium.